Aiven operates 24/7/365 monitoring on all Aiven services and Aiven personnel will be automatically alerted on any service anomalies. Aiven personnel will rapidly address any issues in system operations requiring manual intervention. For regular subscriptions Aiven provides free email support regarding problems using and accessing the Aiven services. Responses are provided on a best-effort basis during the same or next business day. You can find the support contact information from this help article. Aiven offers phone support and same-day email support as additional services. Aiven offers two availability levels for phone support: Office Hours Support (business days: Monday to Friday excluding any public holidays in Finland, from 08:00 to 18:00; CET) and 24/7 Support. Phone support includes guaranteed response within 15 minutes to calls regarding ongoing issues with the service. Investigation of high-severity cases will start within 1 hour of the call. Investigation of low-severity cases will start within 12 hours of the call. Aiven offers Office Hours (08:00-18:00 CET) phone support for each individual Aiven service at USD $250/month, excluding any applicable value-added tax. 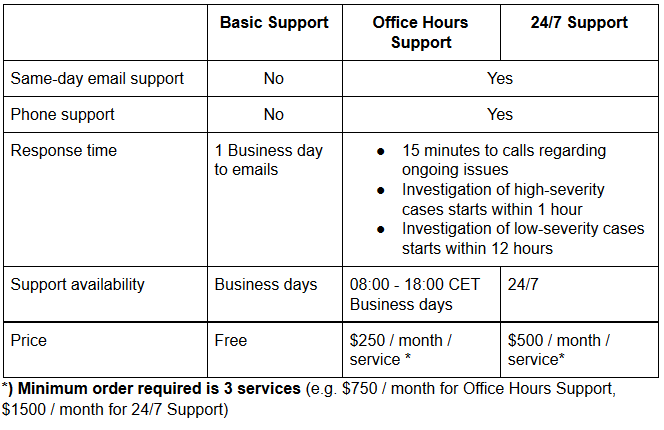 The minimum monthly invoice for Office Hours phone support is USD $750/month. Aiven offers 24/7 phone support for each individual Aiven service at USD $500/month, excluding any applicable value-added tax. The minimum monthly invoice for 24/7 phone support is USD $1500/month. Please contact sales@aiven.io for ordering your own support plan. Aiven Office Hours phone support and Aiven 24/7 phone support shall be invoiced with same terms as Aiven Cloud Services as defined in Aiven General Terms and Conditions.